I love doing my nails, it's something that my daughter and I love doing together. Since starting our DIY Section on the blog, I've been finding tons of different do it yourself projects all over the web that are so easy to do, especially on Pinterest. This one I found from on friend of mine on Facebook and had to try it and share it with our lovely readers. I love how different and unique these are. Paint your nails with your base color, let then dry thoroughly. Pour a small amount of rubbing alcohol in a small bowl. Stick your finger in it for about five seconds. Add a coat of clear nail polish. Let Dry. 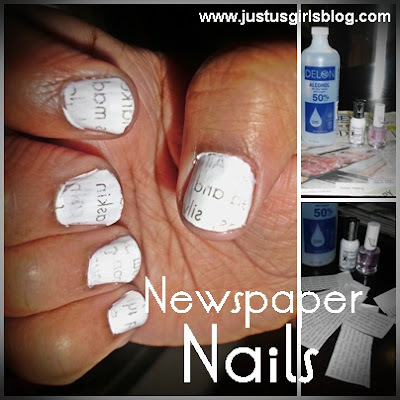 Wash off any other newspaper that may have gotten on your finger. Very cool! I will have to give this a try over the summer. My DD (11) read this over my shoulder and shouted, "Hey I want to do that one day"
Neat! I've wondered how this is done. This is such a neat idea! Thx for sharing it!